1) My face is almost back to normal and I'm not sure why. I don't know if it was the time, the meds, just a flare up of some kind that finally calmed down or a combination of any of those. The rash is completely gone although the hot, spreading redness still comes and comes and my cheeks still look a little "off." I'm still waiting for a call from the dermatologist but hopefully that will come today. 2) As soon as my face started to improve my back went out. Seriously... I reached for a cup and that was it, something locked up. This hasn't happened in a very long time and I felt like it it hit me out of nowhere. Luckily the pain is almost gone now and I'm hoping to work out again tomorrow. 3) Which leads me to.... I'm going back to the gym. I've had quite a few days to think about it and toss around the thoughts of gym and home and yesterday it just hit me. I was sitting, waiting for my mom's appointment to be done, and all I could think about was how much I missed the gym and how much I wanted to go back to it as soon as I can. I think that no matter how hard I try to convince myself I’d be happy working out at home, the things I think about when my mind is clear and nothing is distracting me makes it pretty obvious where I truly want to be. So my plan is to go back as soon as my back is better (I'm shooting for tomorrow), and, to be on the safe side, I'm going to wipe equipment down before AND after touching it so that I don't pick up any illnesses. 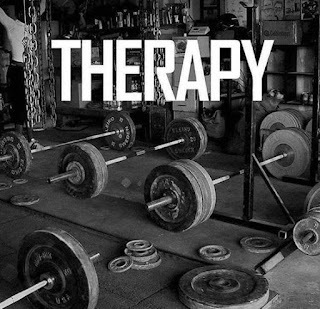 The biggest thing I need right now is to work off this stress with exercise and the gym is MY place to do that. It's my therapy, my hobby, my relaxation and my place to push myself harder with every workout! I need it. 5) I joined another spoonie yoga challenge on Instagram and it starts today so I'll at least do a yoga pose today if nothing else. I'd rather give my back more time now to heal and rest than re-injure it and have to miss even more days in the long-run. 6) I'm seeing my therapist today and am looking forward to that. At least I'll just be able to get everything out of my head! 7) Things with food and weight loss are still going great so there's not much to say about that except that nothing tastes good and I keep running out of food that I can imagine eating. I know this is connected to being depressed but it's pretty annoying to start eating something and realize I really don't want it or like it anymore after two bites. I think that's it for now! !